High UPF protection? Stay Dry performance? Highly breathable? Yes, yes and yes. That's why our exclusive launch of this first layer shirt is such a big deal. There are lots of other technical shirts on the market. What makes this one so special? When you're out on the water, no one wants to worry about protecting themselves from the sun and staying dry and comfortable. 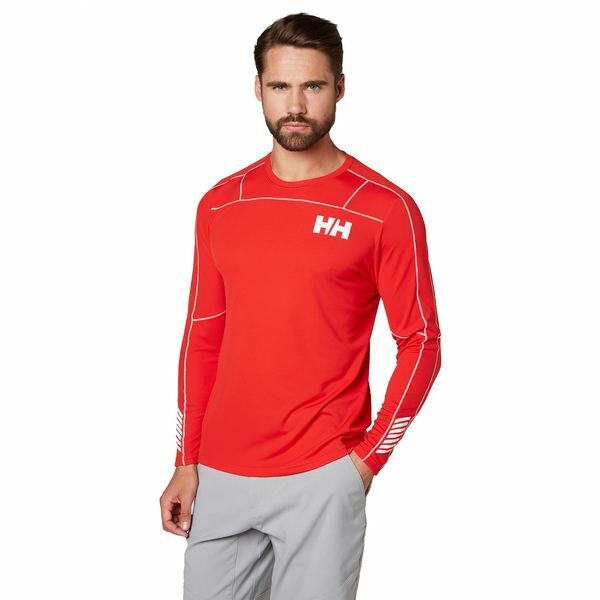 Helly Hansen solves all that with their Marine First Layer Shirt. We collaborated with Helly Hansen to introduce a collection that not only meets the demands of our customers, but ourselves. We're all about the water lifestyle as well (you didn't think all we did was sell boating stuff did you?). We should point out that the versatile Marine First Layer Shirt is designed to be worn alone when the weather is warm or with other layers as the temperature drops. At the core of the Marine First Layer Shirt’s design is its UPF (Ultraviolet Protection Factor) construction. You know how unrelenting the sun can be, especially reflecting off the water. And if you're on an open sailboat, stand-up paddleboard, kayak, canoe, inflatable boat, bass boat, jet ski or any number of other craft without a cabin, shelter from the sun's damaging rays isn't always easy to come by. Just how much protection does this collection offer? Depends. That's right, it depends on which color you select. Each color offers a unique UPF factor depending on the color-blocking design. Generally, the darker the color, the higher the UPF rating. For this shirt, the UPF sun protection ranges from UPF 30 for Olympian Blue to UPF 35 for Graphite Blue to UPF 50+ for Navy and Alert Red. Your choice. Unless you're just along for the ride (and how much fun is that? ), most water-related activities require at least some degree of exertion. What usually happens as your activity level increases? You sweat. Then your sweat hangs around and makes you feel cold, clammy, uncomfortable. Sound familiar? Well Helly Hansen has an answer to that high-energy dilemma—Lifa Stay Dry Technology. This lightweight, two-layer fabric is based on a fiber that is constructed in a completely different way than most other synthetic base layers you'll find. When exposed to moisture (sweat included), the Lifa fibers immediately move it away from your skin to the surface of the fabric. That allows the moisture to quickly evaporate into the air or into the next layer if worn with a jacket or smock. The result? Your shirt will dry quickly. You'll be warm if your shirt is part of a layering system or cool if worn alone, plus dry and comfortable. Did we mention this special fabric is also extremely soft to the touch? You'll have to take our word for that until you get your own shirt.